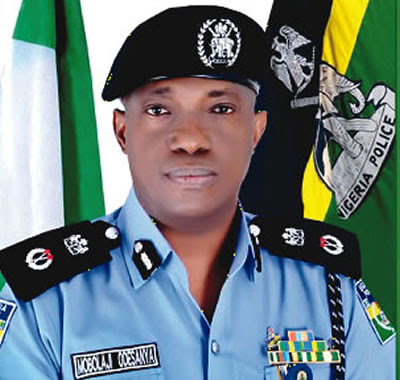 The Commissioner of Police, Rivers State Command, Mr. Francis Odesanya, is under fire for his role in the aborted arrest of a judge of the Federal High Court, Port Harcourt, in the early hours of Saturday, The PUNCH learnt on Sunday. The Rivers State Governor, Chief Nyesom Wike, was said to have rushed to No. 35, Forces Avenue, the GRA official residence of the judge and prevented operatives of the Department of State Services from arresting the judge. Wike, who was said to have had a confrontation with the DSS officials, was said to have been joined at the scene by the police commissioner. A highly-placed source, who spoke to The PUNCH on condition of anonymity, on Sunday, said preliminary report had shown that Odesanya prevented the security agencies from carrying out a legitimate order. Based on the report, he said the police authorities as well as the Police Service Commission would sanction the police boss. He, however, did not disclose the kind of punishment to be meted out to him. The source stated, “The Rivers Commissioner of Police will be dealt with appropriately. It has been established that the DSS officials who were at the judge’s residence had with them duly signed search and arrest warrants. “By stopping the security agents from doing their work, what he did was to obstruct justice. He stopped those people from carrying out a legitimate order. The Public Relations Officer, Rivers State Command, Mr. Nnamdi Omoni, had told journalists that policemen were only at the judge’s residence to ensure there was no breakdown of law and order. It was also learnt on Sunday that no fewer than 15 judges across the country were under investigation by the DSS. It was gathered that the DSS was investigating the judges based on various petitions, which accused them of corruption. A top Federal Government official, who confided in our correspondent on Sunday, said the 15 judges included seven that were arrested on Friday and Saturday. Other arrested were a former Chief Judge of Enugu State, Justice I. A. Umezulike, and Muazu Pindiga of the Federal High Court, Gombe Division. It was gathered that besides the judges, the DSS had invited three court registry staff across the country as part of the investigations into the alleged corruption in the judiciary. “Currently, we are investigation 15 judges, including the seven that were arrested. Three court registry staff have been invited and quizzed. We have facts and figures,” the source stated. The government official faulted a claim that the DSS acted unilaterally without carrying along the National Judicial Council. He stated that the Service sent letters to the NJC and the Ministry of Justice concerning the investigations of the judges. According to him, while the ministry responded, the NJC did not respond, adding that the DSS did not dramatise the arrest of the judges as alleged. The government official also explained that the fact that the judges were under the authority of the NJC did not exclude them from investigation and prosecution. The source further explained the constitutional mandate of the DSS, adding that the service had not intervened in what did not concern it by investigating the judges. Giving an insight into the allegation against some of the judges, he alleged that some of them received bribes to compromise judgments. He also cited the case of a judge who had a N1.5bn estate, alleging that granting of bails to defendants had been turned into an avenue for making money by some judicial officers. It was learnt that the government was not happy with way the police handled the investigation into the alleged Senate forgery involving the Senate President, Bukola Saraki, and his deputy, Ike Ekweremadu. The national leadership of the PDP said the arrest of the judges was unwarranted. Meanwhile, some members of the House of Representatives on Sunday berated the DSS for the arrests of some judges and the raids on their residences on Friday and Saturday last week. Similarly, the Chairman, House Committee on Federal Judiciary, Mr. Aminu Shagari, accused the DSS of “failing to follow due process of the law” by invading the homes of the judges and arresting them. The Chairman, House Committee on Justice, Mr. Razak Atunwa, also said the DSS overstepped its bounds. House Minority Leader and Leader of the PDP’s caucus, Mr. Leo Ogor, stated that after analysing the Act establishing the DSS, members could not find a provision to justify Friday’s action of the agency. Ogor added, “We condemn in its entirety, the said Gestapo invasion of the residences and arrests of the judges at those odd hours. It is not only unlawful but a threat to due process, usurpation of the responsibilities of the Nigeria Police, Economic and Financial Crimes Commission, Independent Corrupt Practices and other related Offences Commission or the National Judicial Council. “We have taken pains to further analyse the National Security Agencies Act, from where the State Security Service, under the Provision of Section 3, derives its powers. “We make bold to state that we could not find anything like the fight against corruption or financial crimes in the SSS mandate. Shagari, a member of the ruling APC from Sokoto State, told The PUNCH on Sunday that the manner the judges were arrested humiliated the judiciary. Shagari explained, “There are rules for handling issues such as this. These are honourable justices and of the Supreme Court especially. Also, it was learnt that the issue would be one of the major subjects of debate on the floor of the Upper Chamber of the National Assembly when plenary resumes on Tuesday. Two senators, who spoke to one of our correspondents on Tuesday, condemned the DSS for the reported ‘Gestapo style’ deployed in the operations by its operatives. The Deputy Minority Whip of the Senate, Senator Abiodun Olujimi, described the raids by the DSS as being in bad taste and a return to the anarchy prevalent during military rule. The Chairman, Senate Committee on the Federal Capital Territory, Mr. Dino Melaye, on Sunday, condemned the arrest and invasion of the residences of the detained judges. The position of Melaye of the APC, representing Kogi West, was contained in a statement he issued in Abuja. He added, “There is no doubt that many judges are corrupt. It is also important to state the need to sanitise the judiciary of corruption that make judges to give commercial rulings which create terrible precedent in our legal system. Judges have no immunity and can be tried and should be tried but the use of DSS is absolutely wrong. Human rights lawyer, Mr. Femi Falana (SAN), on Sunday, urged the DSS to release the detained judges. He, however, described the call by the leadership of the NBA for the unconditional release of the judges as an embarrassment to the “incorruptible members of the bar”. He urged the Attorney General of the Federation and Minister of Justice, Mr. Abubakar Malami, to ensure that the judges were immediately arraigned without delay. “However, it is a matter of grave concern that the legal profession has allowed the denigration of the hallowed temple of justice because of the misconduct of a few corrupt judges. “For several years, judges, who committed grave criminal offences, were not prosecuted but merely retired by the authorities on the recommendation of the NJC. A rights advocacy group, Socio-Economic Rights and Accountability Project, has written Buhari, demanding the immediate and unconditional release of the arrested and detained judges. The group, which also wrote the United Nations on the case, threatened to take legal action, both locally and internationally, against the President should the judges not be freed immediately. SERAP added, “We are seriously concerned about the wave of arrests, intimidation and harassment of judges across the country by the DSS. While we fully support the government’s efforts to eradicate judicial corruption, we cannot accept anti-corruption strategies and methods which patently offend the rule of law and undermine the authority, integrity, sanctity and independence of the judiciary. Also, mixed reactions have continued to trail the raids on the houses of the detained judges by the operatives of the DSS. In separate reactions to the invasion on Sunday, elder statesman, Alhaji Tanko Yakassai; a member of the House of Representatives during the Second Republic, Dr. Junaid Mohammed, and an Abuja-based lawyer, Kayode Ajulo, gave their perspectives to the action of the DSS. Yakassai called on Nigerians to rise up and resist what he called a gradual slide into fascism. He said, “What is happening now in Nigeria is reminiscent of what took place in Germany after the accession to power of the Nazi party in the 30s. It is a repeat of the same scenario of what happened to Italy, Portugal and Greece under fascist regimes in those countries. “A close look at the happening in Nigeria nowadays is frightening. It looks as if we are really sliding into fascism. We have to stop it before it becomes a monster that will consume everybody. Mohammed said judges as citizens, could not be above the law. He explained that the nation’s laws did not explicitly say the DSS should not arrest judges, stating that it was not out of place for judges, who were suspected of committing criminal offences, to be arrested. Ajulo said as a legal practitioner, he believed in the rule of law, adding that getting rid of corrupt judges from the system must follow proper procedure. He explained that no arm of government constantly reviewed itself like the judiciary. But a former Commissioner of Police in Lagos State, Alhaji Abubakar Tsav, has advocated what he called “a Jerry Rawlings treatment, which was carried out in Ghana”, to any public official found guilty of corruption in Nigeria. Tsav, who decried the reports of alleged corruption against some judges, submitted that any judge, who out of greed, succumbed to the violation of oath of his or her office, should face the wrath of law. Tsav, in a statement in Makurdi, the Benue State capital, on Sunday, said, “The law is no respecter of anybody, hence, Nigeria should mets out the treatment that a former President of Ghana, Jerry Rawling, meted out to corrupt leaders in his country if found guilty of similar offencee in Nigeria. The Executive Director, Community Outreach for Development and Welfare Advocacy, Mr. Taiwo Otitolaye, said the action of the DSS amounted to impunity. Otitolaye, in a telephone interview with one of our correspondents in Ilorin, the Kwara State capital, on Sunday, said the action of the DSS was against democratic tenets. A social critic, Olola Kasum, however, said he was in support of any action taken by Buhari to fight corruption in the country. Also, the APC in Ekiti State has berated Governor Ayodele Fayose for criticising the DSS for its raids on the houses of some judges. It said Fayose’s attack on the service followed the same pattern of his criticisms of other anti-graft agencies anytime the governor felt threatened by the activities of these agencies. The party also criticised the NBA for condemning the DSS, wondering why the umbrella body of lawyers maintained silence when the judiciary faced a more daring and contemptuous challenge in the past, especially, when Fayose allegedly led thugs to attack the court in Ado Ekiti. In a statement in Ado Ekiti on Sunday, the APC Publicity Secretary in the state, Taiwo Olatunbosun, stated that contrary to Fayose posturing as fighting for the rule of law, the governor was actually fighting for his own survival. He said, “It is most likely he has something he is hiding that we do not know. “Fayose’s attempt to set Ekiti people against the DSS through inflammatory statements in a live broadcast on the state media to, again, instigate the people against security agencies, will not save him from facing justice in his numerous brushes against the law.